Press News, headquartered in Ghent, Belgium, publishes magazines in Dutch and French which celebrate the royal families of Europe (and occasionally those of the Middle East and Asia), and also covers those of Belgium and the Netherlands. The magazines include Royals (Dutch), a monthly distributed in the Netherlands and Flemish-speaking Belgium; Royals (French), a monthly distributed in France, Francophone Belgium, Francophone Switzerland and elsewhere in Europe and Quebec (25 countries in all); Dynasty (Dutch), a bi-monthly distributed in the Netherlands and Flanders; and, Hors Série (French), the French language version of Dynasty, a bi-monthly primarily distributed in France. In addition, Press News publishes special editions or one-shots to cover special events in the lives of the royal families, and a series of tennis specials called Ace. 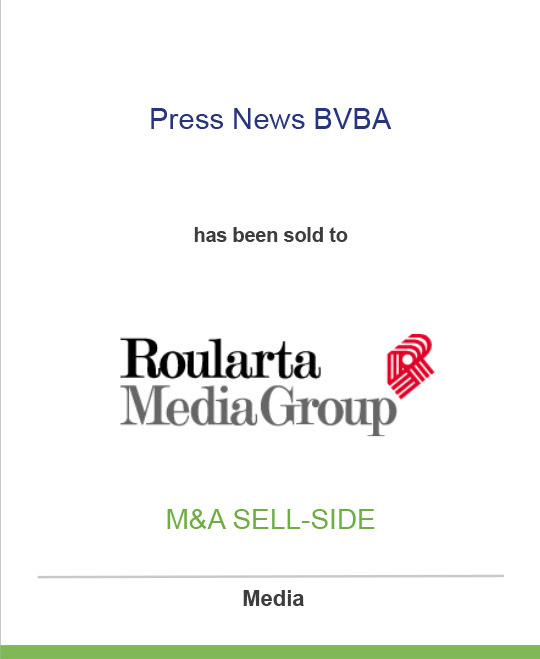 Roularta Media Group (“RMG”) was founded in 1954 with the newspaper De Krant van West-Vlaanderen, which today has a circulation of over 140,000. RMG has grown into an international multi-media company with more than 3,000 employees.Today, RMG publishes De Streekkrant, a group of some fifty local free weekly newspapers with a total circulation of more than 2,750,000; a free lifestyle magazine STEPS; De Zondag, a Sunday publication in the Flemish-speaking part of Belgium with 520,000 circulation; general news magazines, Knack and Le Vif L’Express; financial-economic magazines Trends and Trends/Tendances; Sport/Voetbal Magazine; and Télépro, a contemporary TV magazine. In France, RMG publishes several magazines. Seniors magazines in a 50/50 joint-venture with Bayard Presse Paris; home-oriented magazines (Maison Française, Maison Magazine, Maisons Côté Sud, Est et Ouest) in a 50/50 joint venture with Express/Expansion; and lifestyle titles (Atmosphères and Idéat) in a 50/50 joint venture with Laurent Blanc; and, several Video, Hifi and DVD-Magazines. RMG is also active in radio and TV, video facilities and CD-ROM and DVD production. The company’s Web site is www.roularta.be.